The Weatherford Chapter, organized on February 19, 1903, by Mrs. Alice Knowles Englehoff, holds the honor of being one of the oldest chapters in the Texas State Society. In 2003, we commemorated the chapter's 100th year of service to the community. The Chapter's activities have always been devoted to the objectives of the National Society of the Daughters of the American Revolution, with major educational emphasis on programs to help children and youth in the area. 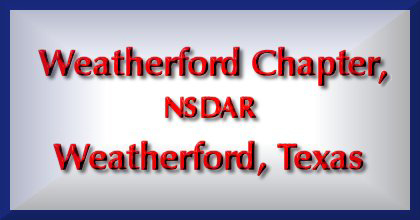 The Chapter established a Scholarship Loan Fund at Weatherford Junior College in 1925 to provide individual loans of $125 to worthy boys and girls who lived in Parker County. At present, the chapter awards a $200 scholarship to a deserving young Parker County woman. Long-time aid to Tamassee and Kate Duncan Smith schools, which are supported entirely by DAR, included medical scholarships of $50 each in 1947. The Chapter has also supported the State Society's educational projects. A C.A.R. Society was organized October 22, 1938, with nine charter members. Present for the occasion was Mrs. Tom Rawlins, daughter of Isaac Parker, for whom the society was named. Mrs. R.N. Grammer, State President, installed the officers, which included Jane Hopkins, now Mrs. James Makins, as President. In 1943, it became necessary to disband this Society. 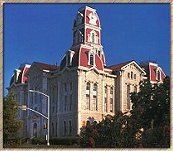 Members have supported the Children's Library (presently Weatherford Public Library) with personal gifts of books, including a book about the Presidents which was published by the Fort Worth newspaper, "The Star-Telegram." The chapter donated a copy of "The DAR Magazine Index" to the Weatherford Public Library and currently donates an annual subscription of "The American Spirit " magazine. The chapter also provided copies of the DAR Lineage books to the library, where lineage worksheets are available to prospective members. We present Good Citizenship medals to young ladies in the seven Parker County senior high schools each year. The chapter honors the winners and their guests at a luncheon. Historical contributions include the location of the first grave in Parker County. It belongs to a girl named Lee, who died of a rattlesnake bite in 1854 and was buried in the Clear Fork community. The committee visited the place where the first Baptist church in the county was organized. The chapter also located the place where the first court of Parker County was held by Judge Buford, which is about five miles north of Weatherford at Weiland. To designate their historical interest, the Chapter in later years placed markers on two pecan trees grown from stock at Mt. Vernon and Arlington, VA. Mt. Vernon was General George Washington's home and Arlington was the home of Confederate General Robert E. Lee. These trees were gifts of Mayor G.A. Holland and planted by the DAR on the Weatherford College campus in 1936. The Chapter sold some bonds purchased in 1942, using the proceeds to mark eighteen graves of former members. Our chapter was present at the Texas Centennial of 1936. Each member signed their names in a DAR Roster Book which was on display at the Texas Centennial. For the section of the Register representing this Chapter, Mr. Douglas Granville Chandor made a sketch of the Parker watermelon for the title page. The Chapter purchased a copy of "History Of Parker County" by Ms. Edith Jordan, now Mrs. Jack Borden, to be loaned to the Centennial. We present library displays and programs, civic proclamations, banners and publicity to the community. To commemorate the signing of the U.S. Constitution on September 17, 1787, the Chapter faithfully observes Constitution Week in some suitable way each September. Of historical interest is a gift of two pieces of china sent through the Chapter to the Texas Room in Memorial Continental Hall. Previously presented to the Chapter by Mrs. L.W. Christian, the beautiful compote and egg cup were from a set inherited by her husband from his great grandfather, the prominent Revolutionary War hero, General Andrew Lewis. The Texas First Ladies' Gown Collection at Texas Woman's University , Denton, includes a beautifully made copy of Sarah Beona Meng (Mrs. Samuel W. T.) Lanham's pretty inaugural gown presented by our chapter. Samuel Willis Tucker Lanham was the last Confederate soldier to serve as governor of Texas (1903-1907). The Lanhams were residents of Weatherford, and their home is included on the Weatherford Historical Tour of Homes. Chapter meetings observe DAR procedure, and include interesting programs on educational, historical, and patriotic subjects. In one particularly poignant program, the Reverend Irving R. Phillips said: "We can make this land of the free a stalwart fortress by making sure we never sell four houses we own - the Court House, the School House, Our House, and God's House." In 1971, eight Certificates of Honor were presented to parents of servicemen who lost their lives in Vietnam. This was an effort to show that the DAR, as an organization, and its members, as individuals, deeply care about tragic losses such as these. We continue to support the goals of the DAR state and national leadership and look forward to continuing our history of excellence for the next 100 years.